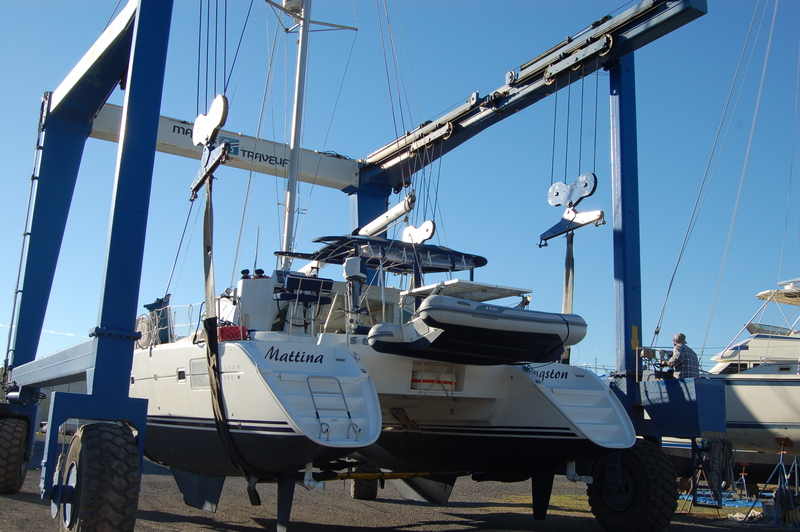 Seven days working on Mattina on the hard, followed by one day launching, and then another seven days commissioning gets her ready for traveling south. Mattina hanging in the travel life always makes me nervous. 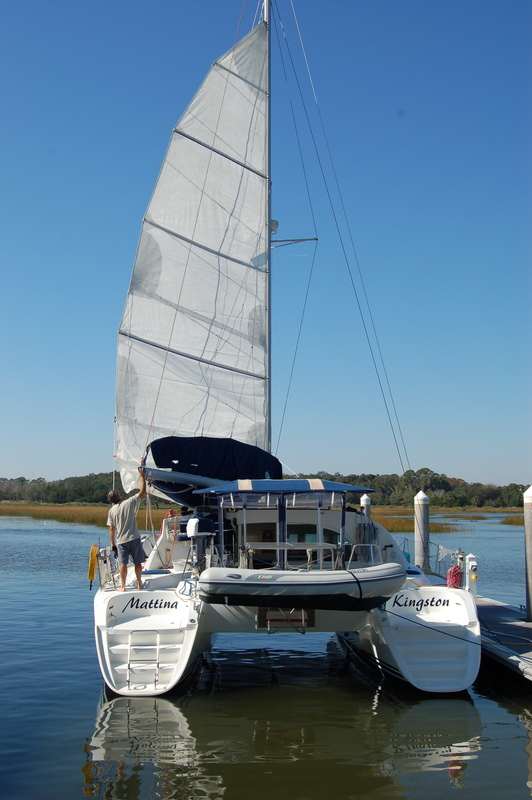 The crew at St. Augustine are professional and take their time, and we launched safely. Mattina in the air: this is just not normal. 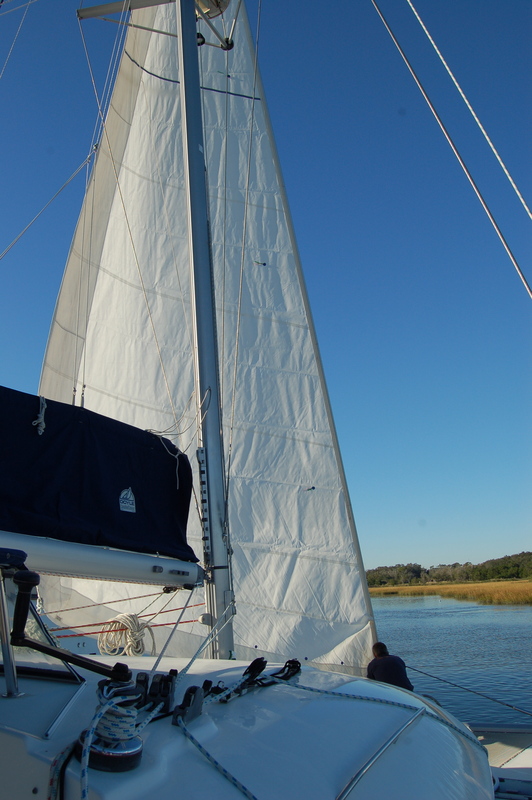 Early mornings are a great time to get the sails up before the wind starts blowing. The sails are stored below during the summer, protecting them from sun and wind damage. We hoisted the Genoa first. Rigging the genoa is easier than the main, so we start there. Gives us a sense of accomplishment. Next up was the main. Happy at the dock with the main sail on. All battens checked, no sail damage and lines are in great shape. The engines are maintained, the dinghy is operational, the fridge and freezer are keeping food cold, the BBQ is keeping us fed, the genset and solar panels are giving us power, the SSB is picking up Chris Parker (weather network), the Wi-Fi antenna is allowing us to access the internet, the water pumps are pumping, and we’re just about ready to leave the dock. We won’t test the water maker until we are farther south and into clearer water, but I know it will work. Next step, untie the lines and start heading south. Hope you are gone south enough with this new storm off the coast. We are in PA and lost power for 4 days. being a dog that didn’t matter to me. Momma Jean said it was tough mixing dog food by flashlight therefore,we got to eat a bit earlier……..Works for me! Not sure I told you there are 6 of us. If I was on a boat I would probably sleep the whole time. I love the rocking motin of a car ride. Good luck and smooth sailing. love M.J.
We’re not far enough south yet to be warm. The cold air seems to have caught up with us. Farley sleeps while we are underway, but has lots of fun running around the deck it their are dolphins or turtles in the area. Glad to hear you got fed even though it was dark. Mattina looks so gorgeous and shiny! Thanks for sharing these great pictures–I can almost feel the light breeze and smell the salt water when I look at them. I can smell the salt, but the breeze is still a little too cool. We had to use the heater last night. I think that’s a first in Florida for us.